Beautiful stone hamlet recently restored situated in quiet and panoramic location on the Chianti Classico hills offering extensive views over the surrounding vineyards. This charming hamlet comprises 6 nice apartments (and 9 double bedrooms) all of which furnished in a Tuscan rustic style and provided with a private furnished outdoor area. 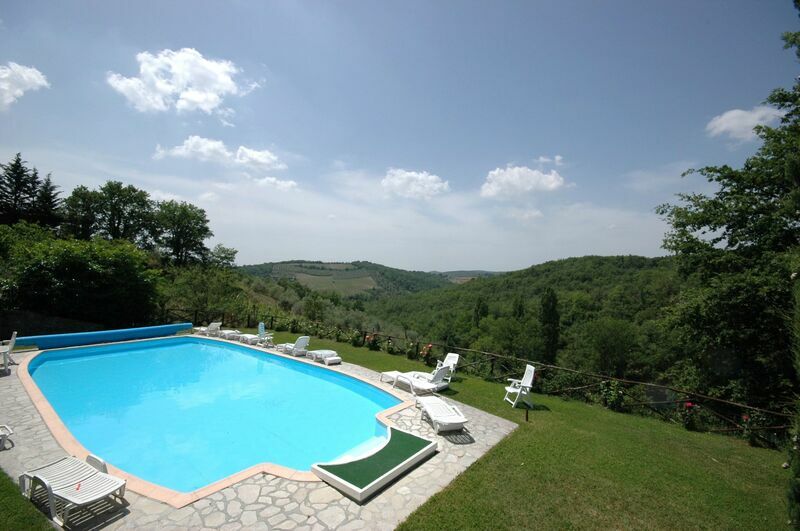 The property is surrounded by a large terraced garden offering nice corners ideal to relax and enjoy the beautiful Tuscan landscape. The Chianti Classico wine produced on the estate is available for clients to be purchased. Cooking classes and wine tasting are available by arrangement. Distances: Gaiole in Chianti with all kinds of shosp 4 km, Radda in Chianti 15 km, Siena 30 km, Florence approx. 50 km. At guests’ disposal: private furnished terrace or garden for each apartment, swimming-pool (18 x 8 m – maximum depth 1,7 m – open from 01/04 to 31/10) to be shared among the apartments and the bedrooms guests, tennis court (artificial surface - free of charge), table tennis, barbecue, lake with fishing facilities. Free internet access (WI - FI). Parking within the grounds. The access to the property is via an unpaved but well-maintained road. Extra services (payable on site): restaurant for buffet breakfast (€ 10,- / per person) and dinner (€ 35,- / per person – 5 courses). Maid service available by arrangement (€ 15,- / per hour). On request it is possibile to arrange wine tasting (€ 15,- / per person) and cooking classes (€ 35,- / per person). Baby bed available on request (free of charge). 1st floor: living-room (TV) with fireplace and dining area. 2 steps up: kitchen (freezer, microwaves, toaster), double room with ensuite bathroom with shower. 2nd floor: twin-bedded room, double bedroom, bathroom with shower. Local Tax: 1,5 € per person/per day for the first 7 days of stay (not applicable to children tunder 12 years).